My grandfather invented the home computer. Or so the photo suggests, according to a 1954 article in Popular Mechanics. Hey, I’m a proud grandson! Trouble is, there was never any such article. So where did this picture of Edward G. Wellmeier and his amazing home computer come from, and more to the point: why am I writing about this, aside from the fact that it makes for a good story? With all of the recent blogging and discussion about who owns content – i.e. the original writer/creator or the company for whom it was created – sponsored content, promoted content or native advertising versus editorial content and, certainly not least important, the plain old nasty stealing of content, it’s enough to make your head spin. Mine anyway. So I thought I would wade in and write something to try to sort it out for myself, if not for you. And using this story about my grandfather serves my purpose. But first, and this is directed at my marketing and PR brethren: most of the end-users of all this content that we create, purchase, share or otherwise use to market products or services don’t really care about these issues, nor should they. They are thankfully spared the endless clarifications and arguments back and forth on social media or at US Federal Trade Commission hearings, the jargon and the solipsistic meanderings. I’m confident most consumers can use their own good judgment on whether content – however it’s labeled – has any value for them in making a buying decision. I’ll come back to this later in the post, and welcome your comments. Now, what about that home computer as envisioned in 1954, and my grandfather’s role? The story was emailed to me in early 2005 by my cousin Brian Wellmeier, who by sheer serendipity a few days earlier had noticed a curious photocopy taped to the side of a printer at his office. He did a double take, immediately recognizing the image of his ancestor and knowing it didn’t belong in the picture. After tracking down the online source of the photocopy, Brian realized that someone had randomly chosen Edward’s picture from the Wellmeier family website with the purpose of creating an image that supposedly came from a 1954 issue of Popular Mechanics Magazine. As it turns out, the image wasn’t intended to be a hoax at all, but was created by a Dane named Troels Eklund Andersen for an online Photoshop contest organized by Fark.com. The story gets better. Scott McNealy of Sun Microsystems later used the image in an Oracle Open World Conference keynote speech, and Lotus Founder Mitch Kapor posted it to his blog. Grandpa Wellmeier had hit the big time with the Silicon Valley crowd! Full-size display of US nuclear sub systems control station at the Smithsonian Institute, circa 2000. Subsequently, a trio of “myth-buster” type of websites – Hoax-Slayer, Truth or Fiction, and Snopes – picked it up and wrote articles that provided some background information putting all the pieces together. It turns out that the massive machine in the background is a full-scale display at the Smithsonian Institute of a US nuclear-powered submarine’s maneuvering room. Troels also Photoshopped a vintage ‘50s TV to the far wall in the picture, and superimposed a '70s-era IBM-style printer onto the museum's explanatory panel in the foreground. Troels Eklund Andersen no doubt enjoyed creating the photo mashup and submitting it for a contest. He probably didn’t win anything, but we can appreciate his imaginative caption-writing and Photoshop skills. Some high-powered technology executives used it at a conference and in a blog post, probably generating a few chuckles and demonstrating they had a sense of humor. Hoax-Slayer, Truth or Fiction and Snopes found a near-perfect subject for their website audience constantly hungry for the outing of online fakes and phonies. Brian had fun sharing it with the rest of his cousins, bringing the far-flung clan together via email for a good laugh. And now I’m using the story for a blog post, piggybacking some of my own thoughts about content – and the many issues surrounding its creation and use – and sharing them with my readers. Perhaps I am over-simplifying this, but value is provided to many parties engaged throughout the process, even though it’s unlikely any money exchanged hands for this content anywhere along the line. Everyone used it for his or her own purposes, copying and pasting text, images and URLs hither and yon. I expect we’re all fine with this, including the readers. I trust they’re smart enough to understand what’s being communicated or if anything is being sold to them, aside from the annoying pop-up adds on the myth-buster websites, which nobody pays attention to anyway. I’m all for content producers to be fairly compensated or appropriately credited for their work, whether they’re employees, freelancers or consultants. After all, this is how I make my living. I abhor hearing about situations like those in which Mark Schaefer, the marketing and social media strategist, found himself. As he so bluntly writes, "If you are a blogger, expect to be copied, cheated, and ransacked. Expect to be treated like a piece of meat." I certainly agree, and there's no valid reason why permission wasn't requested or attribution provided in these cases. But in many other situations, content – whether it is written copy, a photo, illustration or video – takes on a life of its own. Sometimes, it grows “legs” that carry it far beyond the original intention or control of the owner, whoever that may have been. The audience doesn’t care. As for the whole sponsored content versus editorial content argument, this is really nothing new, except for the shape-shifting window of the Internet where we now spend most of our reading hours. Any resolution of this issue is beyond the scope of this post, but I do think we give consumers too little credit in their ability to sort out whether content is native advertising or “real” editorial. They’ll figure it out in the same way that very young viewers of television cartoons and advertising do, and file it in the appropriate mental bin, useful or not. 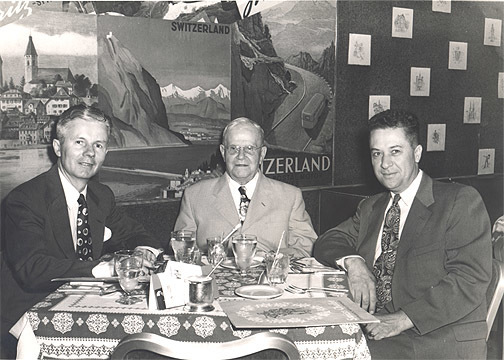 Uncle John Russell, Edward and Al Wellmeier (my dad) at a Chicago restaurant, mid-1950s. As for the original poster boy in this content story, Grandpa Wellmeier didn’t benefit at all. I like to think he wouldn't have minded that his image was lifted, and that he would have enjoyed playing a central role in such a comedy long after his death. Edward Wellmeier was an entrepreneur and started his share of successful ventures in Dayton, Ohio – a house-painting firm, residential construction company, several hardware stores, coal and building materials supplier. He and his wife also found time to raise 11 children. Born a century later, he might very well have had what it takes to be in the thick of the tech boom: venture capital, cloud computing, big data or mobile apps. But was he the originator of the first home computer? Only to the extent that it serves our purposes. Update: Since posting this, I learned another way to track some of the other content users of this photo of Edward Wellmeier and his home computer. TinEye is a free reverse image search service that allow one to ascertain where and how many times an image is used on the Internet. In this case, Troels Eklund Andersen's composite photo of a home computer and Edward Wellmeier can be found on a whopping 424 different website pages! That's a lot of people using this image to create content for their own purposes.